Food plants chiefly members of the Rubiaceae, both introduced and native. Mature larvae are green or even blackish with black horizontal lines on the back and white spots outlined in red along the sides. The back of the head and the tail are covered in small white 'warts', those on the tail horn are black; head brown to green. 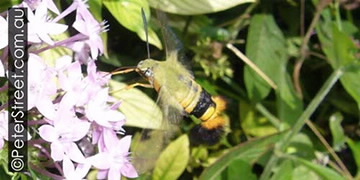 Adults with broad brownish body to 4 cm long with black transverse bands, thorax covered in brown hairs, the wings are clear with darker margins.